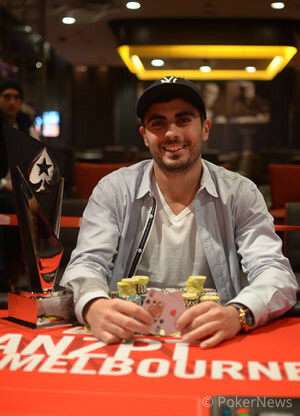 ANZPT Melbourne Repechage Main Event Champion, Anthony Hachem (Photo thanks to Heath Chick, PokerStars blog. After five days of tough poker, the 2013 PokerStars.net ANZPT Melbourne Repechage Main Event has come to a close. In the end it was Anthony Hachem who took down the trophy, all the glory and the $181,460 first-place prize. Heading into the final day it was Fabian Craib who held the chip lead, but he had eight formidable foes ready to play poker. One of the two international players who was hoping to give Craib a headache was Ian Thomson, but in the space of two hands, Thomson would be eliminated in ninth place. Thomson lasted just 30 minutes before a run in with Anthony Hachem crippled his stack, with the remainder going to Iori Yogo in the next hand. It all started with Dean Francis opening the pot with a bet of 125,000 in chips. Both Hachem and Thomson called from the blinds as the flop showed . Hachem checked as Thomson took the chance to bet. Francis mucked his cards, before a short pause from Hachem was followed with an all-in call for 970,000 in chips. Thomson convinced himself to call, but had run his into the bottom set of Hachem, who had . The very next hand saw Thomson move all in pre-flop with his against Iori Yogo’s , and although he was in front, a cruel turn card on a board reading , spelled the end for the man from the United Kingdom. Dean Francis came into the final table as one of the bigger stacks, but a run in with the in-form Iori Yogo, would produce a massive pot early, sending him to the rail just minutes after Ian Thomson’s elimination. Yogo put the pressure on Francis, by re-raising all in, putting Francis’ last million at risk. He made the call and tabled and was in front of Yogo's . The fell on the flop, however, giving Yogo the lead, and when the board bricked out, he had moved into the chip lead, as Francis was left shaking his head. With Thomson and Francis out of the way, the short-stacked Tony Kondevski had managed a couple pay jumps, but this is when his day would end. Kondevski’s last hand saw him all in holding and running into Anthony Hachem holding . No help came for Kondevski and it was all over for him in seventh place. Following Kondevski’s elimination, the bust-outs of the two most notable players at the final table made things interesting. Daniel Neilson would find the door in sixth place, followed by Michael Kanaan two hours later in fifth. Neilson’s elimination saw him open-shove all-in for his last 950,000 from the small blind, and get called by Michel Bouskila in the big blind. His was up against and when the board ran out eight-high it would mean the end for Neilson. Kanaan’s last hand saw him move all-in for his last 1,600,000 in chips pre-flop and get called by Anthony Hachem. His was way in front of the but an unlucky river on a board showing saw Hachem hit his trump-card, as Kanaan was sent out the door. Within the first hour, three players had already been eliminated and after having Neilson and Kanaan join them two-hours later, it would be another hour wait to see the original chip leader join the club, beyond the rail. Fabian Craib made his presence felt throughout the final table, but was finally eliminated leaving the tournament floor. Craib’s bust-out hand saw him shove for his last 2,320,000 with Anthony Hachem calling, after opening the pot with a bet. His was behind to Hachem’s and a six-high board would see him leave in fourth. The chips were relatively even during three-handed play, with Hachem and Iori swapping the chip lead while Michel Bouskila sat and watched. Then, Hachem surged away, building his stack to cover his two opponents by a few million in chips. Bouskila wanted in on the action, and finally moved all-in for his last 2,500,000 in chips holding but ran into Yogo’s . Bouskila would have the smallest of outs to win the hand on the turn, but it wasn’t his day as the board ran out as we began heads-up play. Hachem held a 2-1 chip lead heading into the heads-up battle and it would take just over and hour for him to eliminate Iori Yogo in second place. A gallant effort from Yogo sent him home with $126,600 for his effort. More importantly for him, he propels himself to the outright leader in the race for the ANZ POTY award in the current season of the ANZPT. And with that, Hachem was crowned the 2013 ANZPT Melbourne Repechage Champion adding to an already impressive resume, including a title recently won at the 2013 Aussie Millions! 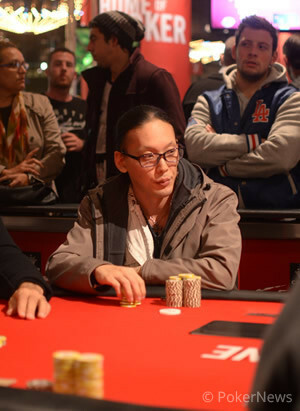 That wraps up PokerNews' coverage of the ANZPT Melbourne Repechage Main Event. A big congratulations to Hachem and to all the other winners. It was another great event run by PokerStars and the staff here in the Crown Poker Room. In the space of a few hands just after the break, Iori Yogo has been eliminated from the tournament. In the first, Yogo opened to 400,000 before Anthony Hachem raised to 1,100,000. Yogo called as both players saw the flop fall . A continuation bet of 1,500,000 from Hachem was too much for Yogo, who mucked his hand, dropping down to 2,850,000 in chips. A few hands later, Hachem opened to 500,000, before Yogo moved all-in for just over 3,000,000. Hachem called and both players tabled their cards. The board ran out to see Yogo miss with his straight draw and live cards, to be eliminated in second place, earning $126,600 for his efforts. With that second placed finish, Yogo has propelled himself to a commanding lead in the race for the ANZ Player of the Year, with only two more stops in the current season for his rivals to catch up. Heads-up resumes as Anthony Hachem still holds a demanding lead. The two players are taking a short 10-minute break. Iori Yogo opened for 400,000 and was called as the flop fell . Anthony Hachem then led for 550,000, but was met with an instant all-in, as he mucked his cards, adding some much needed chips to Yogo's stack. After losing another hand to drop him down to just 1,800,000 in chips, Iori Yogo had to find a double quickly. He moved all-in for his last 1,815,000 from the button and was called as both players tabled their cards. Hachem had the chance to win the event, until the dealer spread out the board of . The brought a collection of sighs from the rail, as Yogo won the hand to stay alive. Anthony Hachem limped into the pot, before being met with a bet of 550,000 in chips from Iori Yogo. He made the call as both players saw the flop come . Yogo confidently threw out a continuation bet of 650,000, but was caught off-guard, when Hachem announced all-in over the top. He laid down the hand, falling to 3,000,000 in chips. Anthony Hachem opened to 400,000 from button, before Iori Yogo bumped it up to 1,200,000. Hachem made the call as both players saw the flop come . A check from Yogo saw Hachem slide out a bet of 1,500,000, which received an instant call. The on the turn had both players slow down, checking, to see the fall on the river. Another check from Yogo, brought a final bet of 1,100,000 from Hachem, as Yogo thought about his decision. He finally mucked his cards, as Hachem goes back over 10-million in chips.